Our planning for Greece was sketchy at best. The place is big and varied, and before we left New Zealand we didn't really have much time to give any thought to where we should go. Islands - and if so which? Mainland - and if so where? But my father has some lovely friends with a holiday home in the Peloponnese, which they were generously prepared to lend to us. I was a bit hazy about where or what the Peloponnese was, but Dad said it was wonderful, and that was as good a starting point as any. I ordered a guidebook on the Peloponnese online, arranged for it to be delivered to England, and we forgot all about Greece. And then suddenly here we are. Winging it a bit day-by-day in the Peloponnese, with the help of said guidebook - often reading it in the car as we head off, to decide where to stay next. And the area is a wonderful surprise. With apologies for people far more knowledgeable than we were, for whom this is old hat, here's a bit of general information: Basically the Peloponnese is the big almost-island at the bottom of the Greek mainland. "Almost-island" in that the two bits were once joined, but are now separated by the 6km-long, 52-metre deep Corinth Canal, built in the 1890s to speed up journeys from, say, Athens to Italy. One of the many things I didn't realise is that the Peloponnese is oozing both history and myth. Greek gods crop up all over the place, as do places mentioned in Homer's stories the Iliad and the Odyssey. And there's ample visible evidence of civilisation from at least 1500BC. Persian, Spartan, Classical Greek, Roman, Byzantine, Ottoman, Venetian - they've all had a go at the Peloponnese and left their traces. Take as an example Gythio, the town where we've been staying for the last couple of days. Once the port of ancient Sparta (the old town is now under the sea), there's a ruined 1st century AD Roman amphitheatre close to the centre (see photo above), and Turkish-era houses among those snaking up the hillsides. Legend-wise, the town was apparently founded jointly by Apollo (god of light, music and the arts) and Heracles (known as Hercules by the Romans and the bosses at Disney). Heracles (as you may know if you watched the TV shows) was the demigod who fought off snakes while still a baby, then later killed his wife and children in a fit of goddess-induced madness, and was punished with 12 Labours, seven of which took place on the Peloponnese. Not sure when he fitted in founding Gythio. 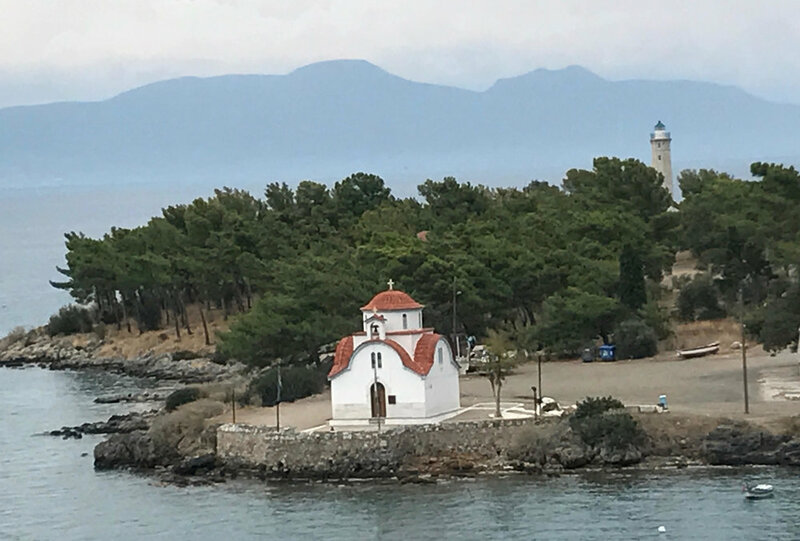 Anyway, cut to the Trojan war story, and just a couple of hundred metres from where I am sitting right now is the island where Helen (wife of King Menelaus of Sparta) and Paris (handsome young prince from Troy) spent their first elicit night of passion after running off together. The elopement/abduction that launched a thousand ships. We walked around the island (now connected to Gythio by a causeway) last night. History doesn't relate precisely where the lovers did the deed, but the place still retains a touch of magic, with its little church, its Mani tower house and its lighthouse. Walking over the possible honeymoon suite of Helen of Troy? Don't say that isn't exciting.